This collection brings together six expert papers on two fundamental issues in European fiscal law. 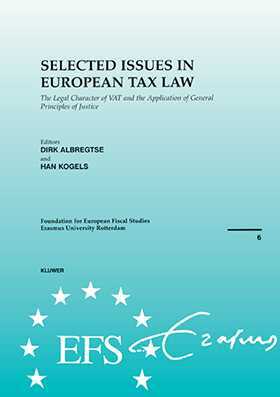 The first issue concerns the legal character of VAT and focuses on the basic principles underlying the European VAT system and their development over the last thirty years. the distinction between the economic and legal approaches to VAT. The second issue concerns the application of general principles of law and justice in European law in general and European tax law in particular. The application of these principles is explored in detail in the context of European Court of Justice case law, direct and indirect taxation in general, and the harmonisation of rules on capital income taxation and the introduction of a common withholding tax in particular. These papers are the result of a conference organised by the Foundation for European Fiscal Studies of the Erasmus University Rotterdam in honour of Fons Simons, who for seven years was responsible for the postgraduate courses and seminars at the Foundation. This brochure is the sixth in a series initiated by the Foundation, which organises postgraduate courses on European tax law, and aims to encourage research on the economic and legal aspects of tax harmonisation and co-ordination in the European Union.